Mid Coast Hospital is committed to avoiding medication errors. It is important that ALL of your healthcare providers know what medications you are taking. For your safety, it is best to keep a medication list with you at all times. This will help to avoid errors and harmful drug interactions. 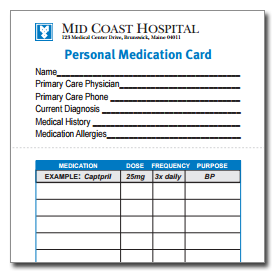 A Personal Medication Card will help you keep track of your medications, proper dosage, and purpose. It is important to include ALL medications including prescriptions, over-the-counter medications, vitamins, and herbal supplements. This should be reviewed at every medical appointment and updated when you change, stop, or begin new medications. The name of the medication. The reason you are taking the medication and what it is supposed to do. When and how to take the medication, and for how long. Foods, drinks, and activities (including being in the sun) to avoid while taking the medication. Possible side effects of the medication and what to do if you experience them. If you would like more information about the medications you are taking, ask your provider or pharmacist. Your healthcare team can also help with finding lower cost medications and treatments. Remember to ask your provider about what medications may not be needed and if there are other treatments that may be more helpful. Using medications as they are intended is important for your health and safety. Every time you take a dose, read the label to make sure you are taking it the right way. Use your medications only as prescribed and never share prescriptions with others. Medications should be stored in a safe place. When you discontinue taking your medications, properly dispose of them to prevent misuse and pollution. Learn more about safe and confidential medication disposal at your local police department. Make sure to include all prescriptions, over-the-counter medications, vitamins, and herbal supplements. Review your medication list at every medical appointment. 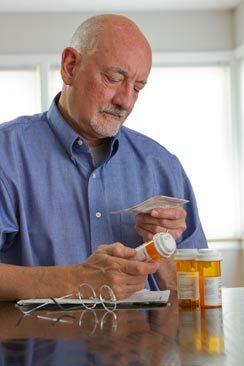 Learn about the medications you are taking including name, dose, purpose, side effects, and things to avoid while taking it. Use your medications only as prescribed and never share with others. Make sure to tell your provider if you are pregnant or breastfeeding, or plan to be. Ask your provider what medications may not be needed and if there are other lower cost treatment options. If you are no longer taking a medication, properly dispose of it at your local police department.